Over the years there have been countless documentaries made about the wrestling business. Some of them have been good, some have been bloody awful, while some have been little more than vanity pieces. In March of 2014 the BBC stepped into that particular arena again with Insane Fight Club, with the show being repeated this past Wednesday night on BBC Three ahead of the broadcast of it’s sequel next week. 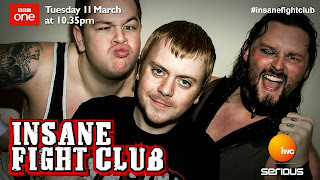 Insane Fight Club takes a look at the world of Insane Championship Wrestling, a Glasgow-based outfit that presents shows aimed at the more adult wrestling fans. In some quarters it's been touted as a 21st century equivalent of ECW, but as I've never seen one of their shows I can't really vouch for that. The cameras follow the crew as they prepare for their biggest ever show, focusing on three main protagonists. There's Mark Dallas, the brains behind the whole operation. You couldn't help but respect Mark's reasons for being in the wrestling business. He isn't one of those mark-types who wants to put on shows just so he can hang out with the guys and put the spotlight on himself, he wants to provide a better lifestyle for his family, especially for his young autistic son. Secondly there's Jack Jester, the proverbial giant of a man and somewhat menacing looking wrestler, a future champion in the making whose proud of the business he's in but also disappointed that his father has never seen him do what he does best. Then, of course, there's Grado, the fan who became a wrestler who gained a cult following with his comedic antics. You may have seen him in TNA recently. I met him once, way back in 2003 at an infamous show in Blackburn, before he became a wrestler and when he was just a "lost Scot". Well, you've got to have some claim to fame, haven't you? Anyway, back to the matter at hand. We follow the three men as they go about their business in the run-up to their big show, with the guys putting on a big show in Edinburgh before focusing on their big Glasgow show, and along the way there's some truly great moments, such as Grado meeting celebrity crimper Nicky Clarke, the creative meeting which is basically one big booze up, and a couple of publicity stunts, one of which involves the roster engaging in a pillow fight. Then there's the big show itself, which despite Mark's worries sells out. Grado wasn't there because of a holiday in Las Vegas (I wonder if he went to see Rick Harrison and the gang), but it's on that night that Jack's Dad finally sees him wrestle. Old man Jester looked shocked at times at some of the things his son put himself through in the biggest match of his career as he won the ICW title. Overall this is a hell of a piece and a brilliant advertisement for ICW. Everyone here comes across extremely well, and you can't help but like the three main characters, especially Grado. It was easy to develop an emotional attachment to them as they faced their various trials and tribulations, no matter how big or small they were. Anyway, with Mark Dallas and his boys have expanded their operation somewhat since this show originally aired it's nice to see that they're doing so well, and it's definitely increased my anticipation for the sequel, which is being broadcast next week. Who knows, I might actually take in one of their shows soon as well! So having said all of that there's just one more thing to do, and that's to give Insane Fight Club the big thumbs up. Insane Fight Club is currently available on the BBC iPlayer at http://www.bbc.co.uk/programmes/p01qv39d. Insane Fight Club II on BBC Three on Wednesday, July 1st at 10pm UK time. You can also find out more about ICW and their upcoming shows at http://www.insanewrestling.co.uk.